This topic introduces SSH configuration for apps in your Pivotal Application Service (PAS) deployment. If you need to troubleshoot an instance of an app, you can gain SSH access to the app using the SSH proxy and daemon. For example, one of your app instances may be unresponsive, or the log output from the app may be inconsistent or incomplete. You can SSH into the individual VM that runs the problem instance to troubleshoot. Operator Entire deployment Configure the deployment to allow or prohibit SSH access (one-time). For more information, see Configuring SSH Access for PCF. An operator allowed SSH access at the deployment level. As a result, apps “Foo,” “Bar,” and “Baz” accept SSH requests. 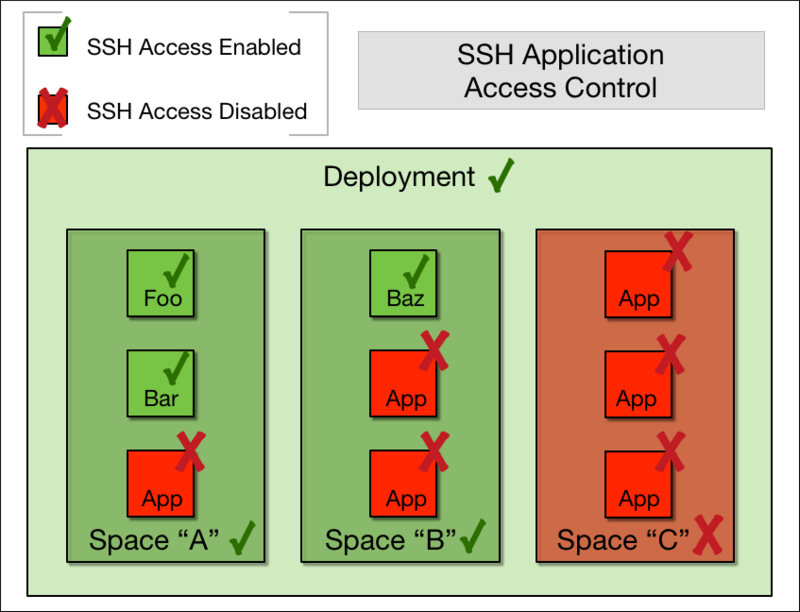 Space managers and space developers can configure SSH access from the command line. The Cloud Foundry Command Line Interface (cf CLI) also includes commands to return the value of the SSH access setting. See the Accessing Apps with Diego SSH topic to use and configure SSH at both the app level and the space level. Pivotal Cloud Foundry deployments control SSH access to apps at the PAS level. Additionally, Cloud Foundry supports load balancing of SSH sessions with your load balancer. The Configuring SSH Access topic describes how to set SSH access for your deployment. The SSH system components include the SSH proxy and daemon, and the system also supports authentication, and load balancing of incoming SSH traffic. The Application SSH Components and Processes topic provides a conceptual overview.